Utah's Grand Canyon is easy to get to. I don't know why more people don't go. I'm not leaving good places out, just because they are easy. 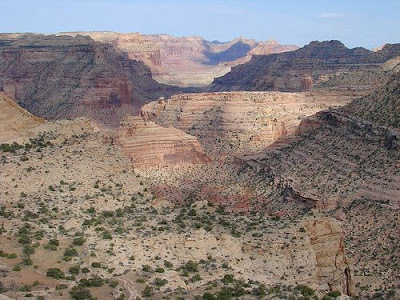 This is one of the most spectacular scenery's I have ever been to anywhere, and I have toured the Grand Canyon extensively, winter spring summer and fall. Does not even compare with the unique beauty of the San Rafael. BLM manages this land. Perhaps they don't want too much tourism. I just know that I love it. AAA has brochures on this place, or Carbon County can provide, or BLM offices. Nice spot for Sunday afternoon drive, long as you remember to bring deet. Here is a link to a nice YouTube film on the Swell, and other related.